Brethren of Pilling Lodge No 7879 ended their Masonic year on a high note at their installation meeting, which witnessed John Damion Eccles being installed into the chair of King Solomon by the incumbent WM Norman Guy, in a ceremony, which was described by the principal guest for the evening Deputy Provincial Grand Master Philip Harry Gunning, as an ‘excellent ceremony by all concerned’. Pictured from left to right, are: Philip Gunning, John Eccles, Norman Guy, David Grainger and Neil McGill. Philip was accompanied and supported by Assistant Provincial Grand Master David Grainger, the newly appointed Lancaster and District Group Chairman Neil McGill and group vice chairman Scott Devine, grand officers Jim Wilson and William Innes (Grand Lodge of Scotland), as well as a host of acting Provincial grand officers which included Reg Wilkinson, Lesley Newlands, Barry Bray, Graham Dowling, James Stewart and Steve McKellar. This fine array of officers were kept in check in a most professional manner by the Provincial Deputy Grand Director of Ceremonies Mark Barton. The WM Norman Guy got the proceedings off to an efficient start and on the conclusion of routine business, the PrDGDC entered the lodge and announced the presence of Philip. On entering the lodge room, Philip was warmly welcomed by Norman and offered the gavel of the lodge. The greetings were graciously accepted but Philip declined the gavel, commenting that: “If the forthcoming proceedings were to be a full ceremony he would have most certainly kept it, but as it is only going to a short ceremony I will offer it back.” This was greeted with much amusement by the brethren. In an impressive ceremony, William Robinson had the privilege of presenting John Eccles as master elect for the ensuing year, before the installing master Norman, placed John into the master’s chair. This is the second time John has been master of the lodge, having already occupied the chair in 2012. 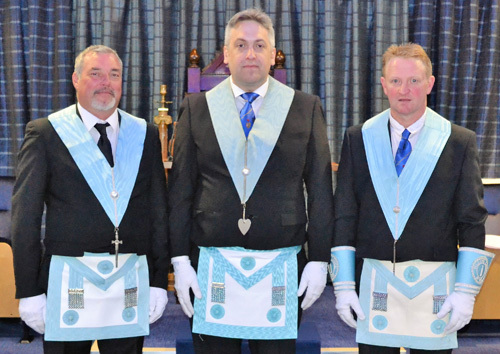 Pictured from left to right, are the ‘light blue’ brethren who presented the working tools: Alan McMonagle, Alun Jones and Chris Wilkinson. The presentation of the working tools which followed were given in an exemplary manner by three ‘light blues’, Chris Wilkinson (third degree), Alun Jones (second degree) and Alan McMonagle (first degree). The additional addresses were also executed with style; John’s presenter William Robinson, gave a fine rendition of the address to the master, Harry Robinson performed the address to the wardens in an equally impressive manner, whilst the address to the brethren of the lodge was performed splendidly by John Prest. Following the appointment and investment of lodge officers for the ensuing year and the announcement that the ceremony was complete, Philip rose to communicate the greetings of the Provincial Grand Master Tony Harrison. Philip informed the brethren that he was sure Tony would want to congratulate all who had taken part in the ceremony, non-more so than the immediate past master Norman, who had performed ‘exhibition grade ritual of the highest order’. Philip was ‘staggered’ to receive notice of donations made by the lodge to charity and good cause totalling some £5,250. This included £1,500 to the Trinity Hospice Childrens Ward, £450 lodge widows, £1,000 Garstang Masonic Hall, £1,000 WLFC, £200 Garstang Masonic Fellowship, £500 St John’s Hospice, £500 MCF 2021 Festival and £25 each to the four Masonic sporting charities. Philip thanked the brethren for their generosity on behalf of the eventual recipients. At the festival of St John held in the superb Wyrebank Banqueting Suite almost 100 brethren enjoyed the traditional installation banquet with great spirit and camaraderie for which the lodge is renowned. In responding to the toast to the health of the grand officers Philip again took the opportunity to offer resounding praise for what he called a ceremony of ‘exhibition standard’. He believed that the excellent standard of the explanations of the working tools by ‘light blue’ brethren was surely an indication that the lodge could look forward to a very bright future, whilst the superb addresses to the master, wardens and brethren were a further indication of the work that had gone into such a fine occasion. Returning to the excellent ceremony conducted by the installing master, Philip noted that Norman Guy’s Provincial rank of Past Provincial Senior Grand Deacon had been awarded in East Lancashire – a situation that needed ‘rectifying’ to properly identify such a proficient Mason as now being firmly under the West Lancashire banner! 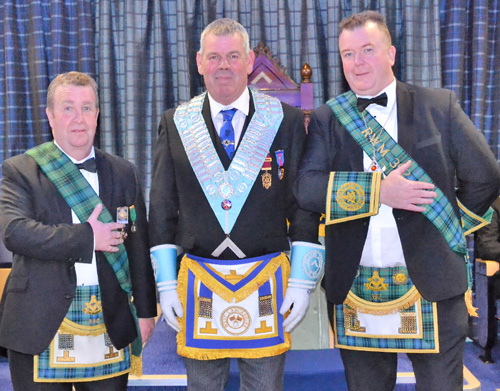 The WM John Eccles (centre) pictured with the brethren of Lodge Caledonian; William Innes (left) and WM John Baird (right). Using the ‘special powers’ vested in him as DPrGM, Philip therefore immediately proceeded to appoint Norman as a PPrSGD of the Province of West Lancashire – an act that brought immediate and resounding support from everyone present. Philip went on to apprise the brethren with an update of Provincial initiatives, particularly in relation to membership. He encouraged those brethren who had not already done so to pledge support for the MCF 2021 Festival and to make their Masonic journey complete by joining the wonderful and interesting Holy Royal Arch. Philip completed his narrative with one of his now famous ‘shaggy dog’ stories which inevitably resulted in great approbation from the brethren. In his toast to the health of the WM, Norman Guy wished John well for the coming year and it was clear that the lodge was in safe hands. Norman said that he could not fail to express how humbled he was by the action of the DPrGM in making his ‘field appointment’ of West Lancashire Provincial rank. The master’s song was superbly performed by Bob Tinsley accompanied by Andrew Keith. As the festivities were drawing to a close John Baird the WM of Lodge Caledonian No 392, was delighted to present John Eccles with a bottle of malt whisky, whilst William Innes, a past master of Lodge Caledonian, also presented Norman Guy with a bottle of ‘the water of life’. The evening’s raffle raised a magnificent £482, which was further supplemented by £45 from the so-called ‘masters’ swindle’ and £27 from a short auction of pot plants. Pictured from left to right, are: Steve McKellar, Scott Devine, Reg Wilkinson, Barry Bray, Philip Gunning, John Eccles, Norman Guy, David Grainger, Neil McGill, Jim Wilson, Graham Dowling, Lesley Newlands and James Stewart.